Construction of the $104.5 million Ian Potter Southbank Centre will begin with an official “breaking ground” event on Wednesday 2 August. Attended by University of Melbourne Vice-Chancellor Professor Glyn Davis, Dean of the Faculty of the Victorian College of the Arts and Melbourne Conservatorium of Music Professor Barry Conyngham, Minister for Creative Industries Martin Foley, and Melbourne Lord Mayor Robert Doyle, the event will include speeches, a brass ensemble fanfare and photo opportunities for media. Professor Glyn Davis said the new building was one of the largest enhancements in the Faculty’s history and would confirm the Faculty internationally as a pre-eminent school of art and music. “The realisation of this project is the culmination of years of collaboration with our project partners, and the exceeding generosity of our donors,” Professor Davis said. Professor Barry Conyngham said the project was a once-in-a century event that would produce Australia’s next generation of musicians and bring together the VCA and MCM. 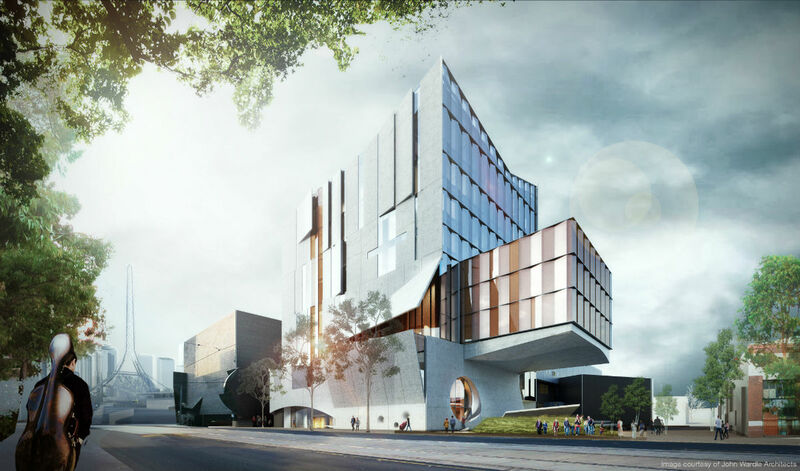 “The University of Melbourne was one of the first Australian universities to offer formal studies in music, and the new headquarters for the Conservatorium will see that legacy continued and amplified alongside all arts disciplines on our Southbank campus,” Professor Conyngham said. Minister Foley said the Victorian Government was proud to partner with the University – and with its philanthropic supporters – to make the project happen. Cr Doyle said Melbourne’s vibrant arts community had been a drawcard for the world’s most-liveable city. “The introduction of the new Conservatorium further confirms Melbourne’s reputation as a hub for the arts,” Cr Doyle said. The Ian Potter Southbank Centre joins the current $42 million redevelopment of the Dodds Street Stables into a visual arts wing, and the introduction of the Buxton Contemporary Museum. Banner image: Artist’s impression of the new Ian Potter Southbank Centre. Image courtesy of John Wardle Architects.